I have made a few sensory bins before, but slacked off while we were in transition into the new schoolroom. Now that we are in here, I have no excuses! We are in full swing and I have the space to store the items and the bins! I am keeping our bin, in an actual drawer in our Ikea system-it is out of reach, so it only comes down when I can supervise. I have no rotation plan of any sort-just to create a seasonal bin and try my best to switch things out every now and then. 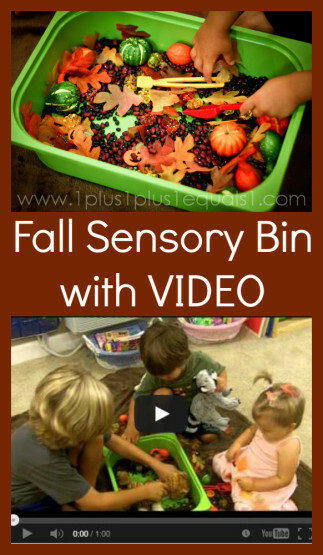 I use many resources to gather sensory bin ideas, but mostly just try to find things I have around, or that I find in the seasonal section of the dollar store ;-). One excellent resource is Counting Coconuts, she has awesome sensory bins! Also-Kylie from Our Worldwide Classroom has an excellent link-up with many sensory bin ideas! It truly amazes me how much all 3 of the kids love this…something SO simple. SO many skills can be exposed in such a fun and easy-going way. The best is when Ladybug sets up camp, IN the bin. I loved how the boys just carry on around her! 😉 Great fun has been had and is to be had as we enjoy our fall sensory bin! Find more Fall Fun here on my website!